Classic Cucumber Sandwiches made with cream cheese, and the perfect seasonings atop cocktail bread are the perfect appetizer for parties and showers! 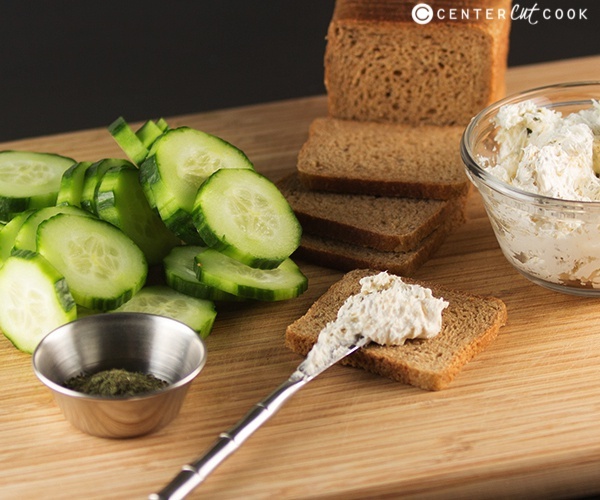 Cucumber Sandwiches are easy to make and always a crowd pleaser! 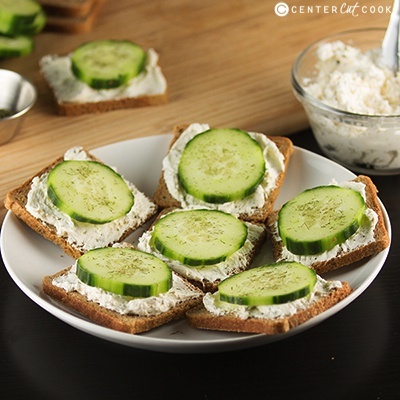 One of the most simple, yet delightfully satisfying appetizers that I always look forward to making and enjoy for parties and showers are these cute little cucumber sandwiches. There’s not a whole to involved with making them, and they are ALWAYS a crowd pleaser which is one of the reasons I tend to make them as one of my go-to appetizers. While some recipes for cucumber sandwiches call for a packet of Italian dressing seasoning, or even ranch dressing seasoning, I like to season the whipped cream cheese myself with dried parsley, black pepper, garlic powder, onion powder, and a little dill. One tip I have learned over the years is that you will want to pat the cucumber slices with paper towels to absorb some of the moisture. ESPECIALLY if you are making them ahead of time for a party. Cucumbers hold a lot of moisture which can result in soggy bread. What I typically do is I’ll slice the cucumbers, place them in a colander, then allow them to sit for a bit so any excess moisture can drain. Right before I place them atop of each sandwich, I’ll pat the cucumbers dry with paper towels. You can make these 1 day in advance, but they are best made just 1-3 hours before you are going to serve them. 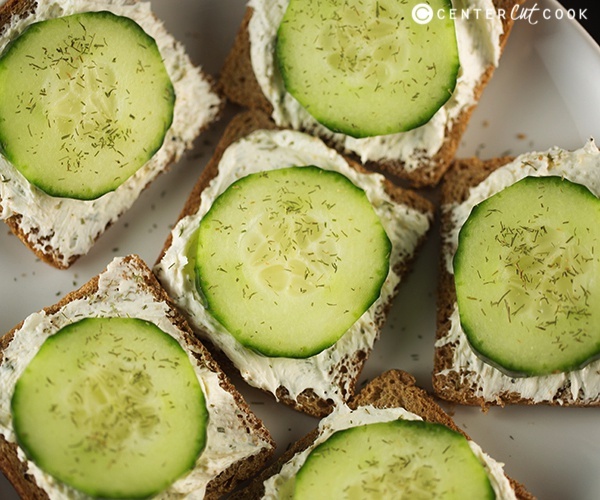 Cucumber Sandwiches are the perfect appetizer for parties and showers, enjoy! In a large bowl, use a large spoon to combine the whipped cream cheese with 1 teaspoon dried parsley, 3/4 teaspoon black pepper, 1 teaspoon seasoned salt, 1/2 teaspoon garlic powder, 1/4 teaspoon onion powder, and 1/8 teaspoon dried thyme. Thinly slice the cucumber and pat the slices dry with paper towels to prevent the bread from getting mushy from the moisture in the cucumbers. 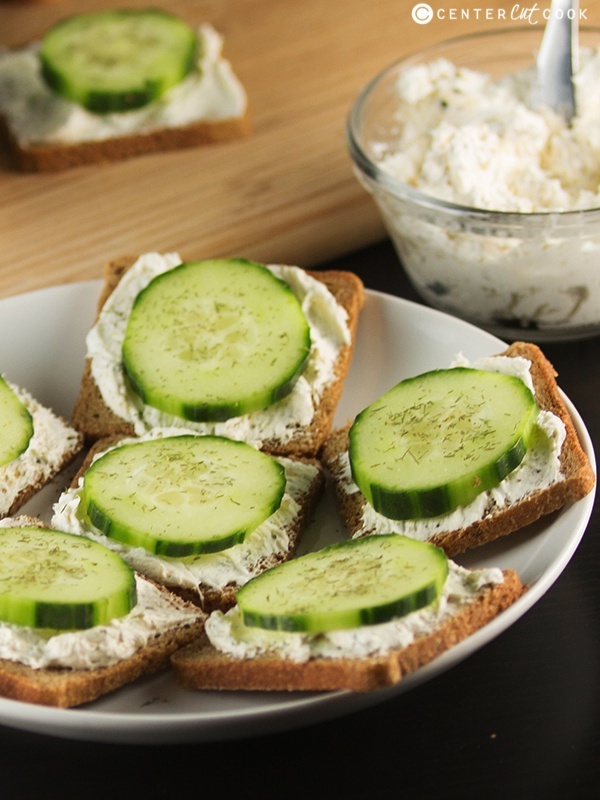 Spread a thing layer of cream cheese mixture on each piece of bread, then arrange 1-2 cucumber slices on top. These are best served immediately. If you are making them ahead of time, be sure to really pat those cucumbers dry with a paper towel so that you aren’t left with soggy cucumber sandwiches.